Today’s color is dark green. Talk about all the kinds of trees you can think of and what trees do for us. If you can, take a walk outside to see the trees together as a family. Using brown and various shades of green paint, spend time painting trees! Some leaves start out dark green, but in the fall, they change color and fall of trees. 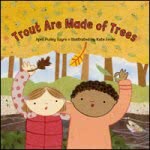 Read Trout are Made of Trees by April Pulley Sayre! Lots of ideas for GREEN crafts!